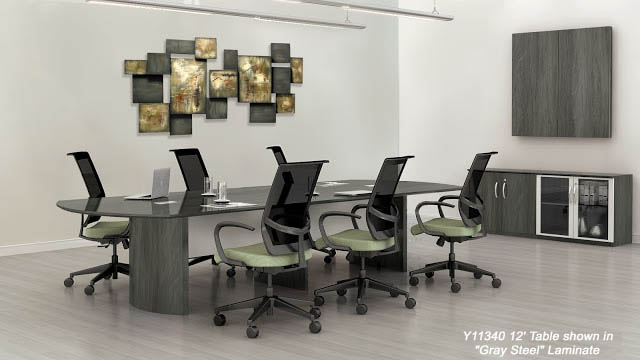 Our Medina Conference Tables are smart, durable and feature a stunning, contemporary look. The unique construction, inspired from Italian designs, includes such features such as "floating" table tops, reverse beveled edges, curved bases and silver table supports. Several table lengths and eye-catching laminates to choose from! 8' table sold above. Other sizes and matching storage accessories sold below. Table top and bases are constructed in durable laminates that are scratch resistant and easy to clean. 1" thick table tops feature reverse beveled table edges. Table tops are suspended on chrome metal posts to create a 'floating' table top look. Silver laminate modesty panel conjoins the curved bases. Each table top features two, pre-installed grommets for wire management. Grommets cut out measures 4" x 8" and comes with flange. Cut outs also fit optional Y12410 Power/Data Surface Module (sold separately below). Cable chimneys in bases allow you to route any cords under the table through the bases for a clean look. 8' Medina Conference table measures 96"L x 42"W x 29-1/2"H overall. One-piece table top with two curved bases. Seats up to 8 people. Ships unassembled. Shpg. wt. 236 lbs. PRICE INCLUDES SHIPPING! (Truck shipment - See Terms & Conditions). Please allow 1 week for delivery. 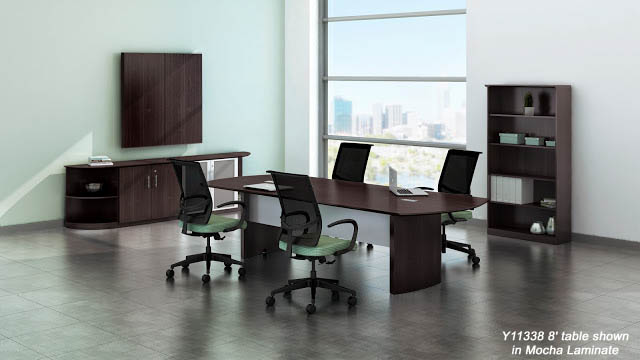 10' Medina Conference table features a clean and contemporary look. Laminate table top is 1" thick and features a reverse bevel edge. Includes two, 4" x 8" grommets for wire management. Power modules sold separately as Y12410 below. Bases include cable chimneys to route cords from underside of table through table bases. Two-piece table top with two curved bases. Seats up to 10 people. Measures 120"L x 48"W x 29-1/2"H overall. Ships unassembled. Shpg. wt. 306 lbs. PRICE INCLUDES SHIPPING! (Truck shipment - See Terms & Conditions). 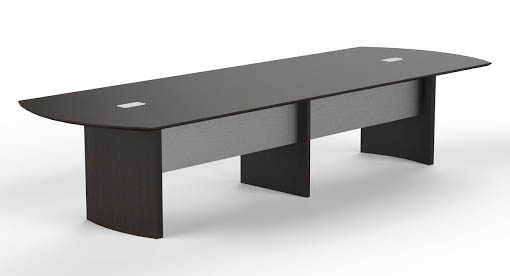 12' Medina Conference table features a clean and contemporary look. Laminate table top is 1" thick and features a reverse bevel edge. Includes two, 4" x 8" grommets for wire management. Power modules sold separately as Y12410 below. Bases include cable chimneys to route cords from underside of table through table bases. Two-piece table top with three curved bases. Seats up to 12 people. 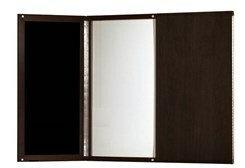 Measures 144"L x 48"W x 29-1/2"H overall. Ships unassembled. Shpg. wt. 358 lbs. PRICE INCLUDES SHIPPING! (Truck shipment - See Terms & Conditions). 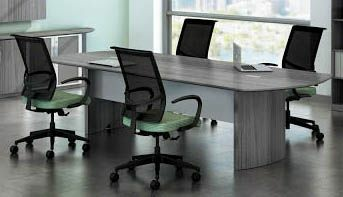 14' Medina Conference table features a clean and contemporary look. 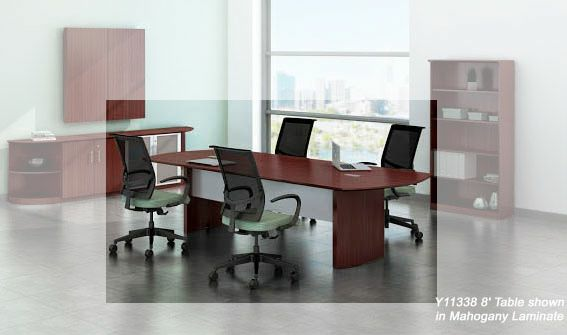 Laminate table top is 1� thick and features a reverse bevel edge. Includes two, 4" x 8" grommets for wire management. Power modules sold separately as Y12410 below. Bases include cable chimneys to route cords from underside of table through table bases. Two-piece table top with three curved bases. Seats up to 12 people. Measures 168"L x 48"W x 29-1/2"H overall. Ships unassembled. Shpg. wt. 399 lbs. PRICE INCLUDES SHIPPING! (Truck shipment - See Terms & Conditions). 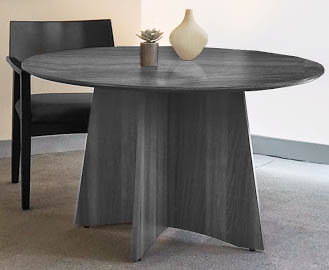 Medina 48" Round Table is constructed of durable laminate. Table top is 1" thick with reverse bevel edges. Seats up to 4 people. Tapered X base. Measures 48"R x 29-1/2"H. Ships unassembled. Shpg. wt. 135 lbs. PRICE INCLUDES SHIPPING! (Truck shipment - See Terms & Conditions). Medina Presentation Board houses a melamine dry erase white board. Includes marker trough and black fabric tackboard on inside of left door. Ships fully assembled. Measures 48"W x 48"H x 3-1/4"D overall. Shpg. wt. 110 lbs. PRICE INCLUDES SHIPPING! (Truck shipment - See Terms & Conditions). 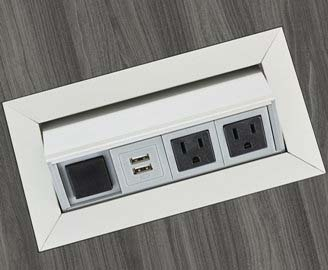 Power Module fits into the rectangular table top grommets of any Medina conference table. Includes two power outlets, two USB ports and power cord. Just press on the cover and the outlets spring up. Press down to lock/close. Aluminum casing. Shipping wt. 4 lbs. PRICE INCLUDES SHIPPING! 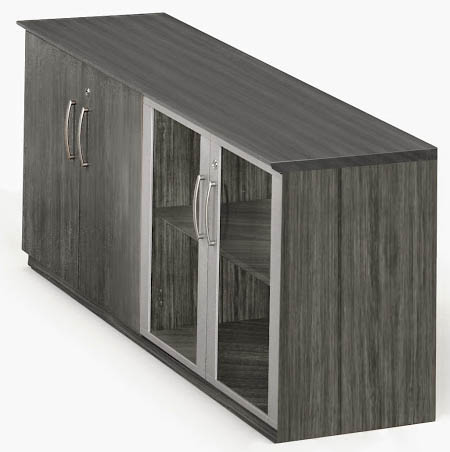 Medina Conference Credenza perfectly accents your Medina Conference Table. 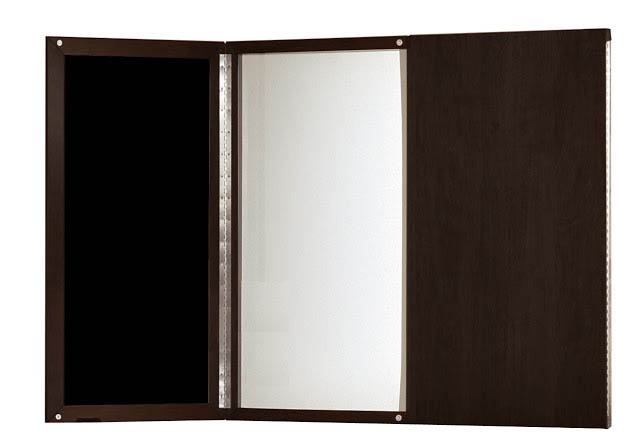 Includes two solid panel and two glass doors, both locking. 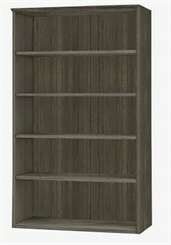 One adjustable shelf behind each set of doors for storage of conference room supplies. Measures 72"W x 20"D x 29-1/2"H overall. Shpg. wt. 180 lbs. Ships unassembled. PRICE INCLUDES SHIPPING! (Truck shipment - See Terms & Conditions). 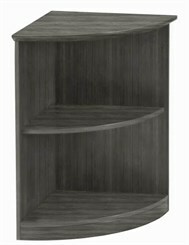 Medina 2-Shelf 1/4 Round Bookcase can be placed on both sides of the Y11345 Conference Credenza to lengthen the credenza and add open storage. Measures 20"W x 20"D x 29-1/2"H overall. Shpg. wt. 36 lbs. Ships unassembled. PRICE INCLUDES SHIPPING! (Truck shipment - See Terms & Conditions). 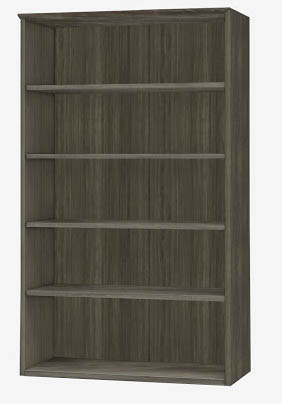 Medina 5-Shelf Bookcase features 1" thick adjustable shelves, each with a 75 lb weight capacity. Measures 36"W x 13"D x 68"H overall. Shpg. wt. 145 lbs. Ships unassembled. PRICE INCLUDES SHIPPING! (Truck shipment - See Terms & Conditions).